From evolving healthcare laws to social engagement, litigation crises to media relations, McKesson's PR chief is hands-on in efforts to enhance the brand's image. Five years ago, McKesson’s social media efforts were akin to "a thousand flowers blooming across the company," says Kris Fortner, director of corporate PR and marketing strategy, so he set out to establish governance and structure around social media and how the company was engaging on it. "One of the first things I did was lead a team that developed an employee-use policy for social media," he adds. "Healthcare is a highly regulated industry. Social media was still not entirely understood by regulators and others so there were a lot of potential risks we wanted to mitigate against." Fortner and his team, who are responsible for all corporate comms matters that cut across the company, including financial, corporate strategy, litigation, and public affairs, set up strategies for Twitter, LinkedIn, and Facebook, testing different approaches that have evolved over time. The group also created social media protocols within its corporate unit and then shared best practices with McKesson’s other business units. In the last few years, the company’s corporate comms unit has expanded, building out another team to run and manage social media. Fortner works closely with the social team, thinking through strategies related to the brand’s comms program. "We’ve also built a content marketing team and the corporate marketing group that serves as the engine, in many ways, for the social media team," he notes. A result of that effort was the launch last year of the North American Better Health Tour anchored by events in Portland, Boston, Minneapolis, and St. Paul, Minnesota. A goal of the tour was to introduce the company’s new brand message. When Fortner joined McKesson nine and a half years ago, Empowering Healthcare was the thread connecting comms and marketing materials for some time. The internal consensus was that "Empowering Healthcare implied we’re a bit behind the scenes and didn’t have any emotion or action attached to it," he says. "Customers only knew us from what they bought from us. If you were a physician, you would think, ‘Oh, you’re a rubber glove company’ or hospitals thought we sell IT systems. No one knew the full spectrum of everything we touch," adds Fortner. A spate of brand research and interviews with customers, prospects, and employees ensued, ushering in a new brand platform for the company: For Better Health. Each local event on the Better Health Tour, attended by customers, business prospects, and healthcare leaders such as pharmacists and policymakers, addressed specific local issues and strategies to bring about a more effective and efficient system to deliver care. Fortner and his team captured content at each event and promoted it via social media. The brand’s biggest presence is on LinkedIn, with 175,000 connections. Its Twitter and Facebook audience is smaller, with 10,000 and 12,000 followers respectively. The tour showcased a best practice example of aligning PR, content marketing, social media, and marketing strategy, he notes. Using a light touch was key to its success. "We didn’t beat people over the head with who we are and what we sell," explains Fortner. "We really wanted a robust dialogue about the need for innovation and disruption to change the way a healthcare system operates." Looking ahead, he is planning an international content-driven campaign for the tour. Similar to the US leg, McKesson wants to spotlight healthcare providers in Europe that are challenging the status quo and create a "library of vignettes about real risk takers globally. Maybe this could turn into a documentary about global health. There is still much to be figured out," Fortner notes. The company is researching how effective the new messaging has been in taking it to the "lofty goal of being one of the most admired b-to-b brands in healthcare," he says. While McKesson has its sights set on being number one in terms of brand reputation, it is already the biggest pharmaceutical wholesaler, and getting bigger. A year and a half ago, the company acquired European wholesaler and pharmacy owner Celesio. Based in Germany, Celesio operates in 15 countries across Europe, including Ireland, where it owns the country’s largest pharmacy chain, Lloyds Pharmacy. Celesio corporate operates as a business unit of McKesson with its own head of comms in Germany that manages the company’s corporate news, as well as country comms managers. Fortner, who recently spent time in Celesio’s Irish office, and his team work with Celesio comms execs and are in the early stages of discussions around integration and branding. McKesson has its eye on future global expansion with Celesio serving as its European wholesaler hub. Fortner spent his first six years in Washington, DC, and considers himself a policy wonk and as someone who had not really seen himself going down the road of PR and comms for a brand. To his surprise, he found many similarities. "Your product is legislation. If you are on a campaign, your product is the candidate. It’s about knowing the audience and your product and delivering the right message to them," he explains. "That has been the case throughout my career and still seems to be a guiding principle." Fortner worked on the 1996 Health Care Quality Improvement Act and HIPAA during his time in DC and says "a lot of the things talked about today were written back then and to see these things come to existence is exciting." Closer to home, in a US healthcare marketplace roiled by the Affordable Care Act, McKesson’s rallying cry around a more streamlined and effective healthcare system dovetails nicely. "We provide software and IT to 96% of the health plans in the US and the ACA is changing the way they’re doing business," Fortner explains. "The ACA will require hard data to prove that [health plans] are going in the right direction and moving from fee to service in this value-based model." With technology a lynchpin to providing efficiencies, privacy concerns remain front and center. Equally important is the ability of IT systems to connect across the healthcare spectrum – from doctor to hospital to pharmacist, for example – to offer a single view of a patient. As the role of IT advances, so too do discussions around what role government should have in regulating healthcare IT – an issue where McKesson has a dog in the fight, especially with its recent decision to fund Carena, a Seattle-based company that sets up telehealth systems so doctors can see patients over the Internet in real time. "Many states have different rules regarding telehealth, which creates some complications. There is still some catching up to do on the regulatory side – and even on reimbursement," says Fortner. In December 2014, the brand launched McKesson Ventures, and in June 2015, along with four other organizations, committed to provide $13.3 million to Carena. "We want to enable the next generation of healthcare delivery," he adds. Headquartered in San Francisco, McKesson’s two biggest business segments are distribution and tech. It is the number one pharmaceutical distributor in the US and Canada and 52% of US hospitals use its technology. McKesson also operates 2,900 Health Mart retail pharmacy franchises. Within these segments, there are smaller units that run the gamut from medical-surgical to workflow solutions that have comms staff who report to their unit president and are responsible for internal comms within their business. Despite the lack of a formal relationship Fortner says, "We work closely across the group." 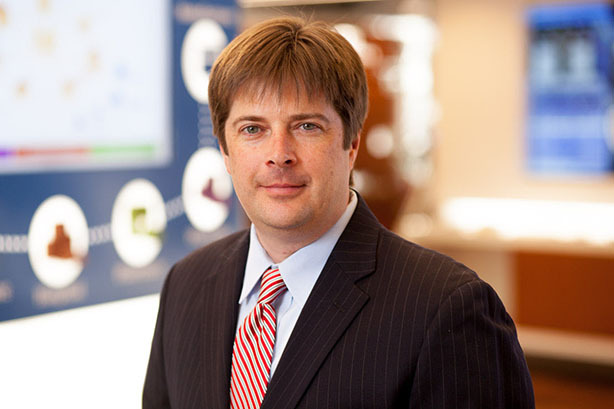 Prior to McKesson, where he reports to VP of marketing Jeff Stalcup, Fortner worked at software company Siebel Systems. "Kris consistently balances two generally opposing objectives: proactive media engagement that promotes the brand and defends the company’s reputation when crises arise. He does this through deep knowledge of our business and the healthcare industry," notes Stalcup. "In the past 18 months, Kris has elevated the function of corporate PR from being simply responsive to one that has proactively raised the visibility of the company, with more positive media impressions in the past year than the previous five combined." 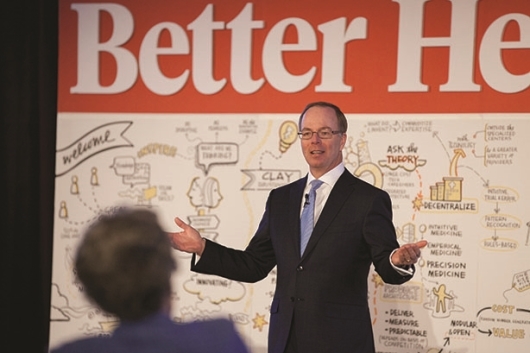 Fortner connects directly with John Hammergren (pictured above), chairman, president, and CEO of McKesson, on issues related to PR. Hammergren, who at the time was co-chief executive, stepped up to helm the company solo during some very dark days in 2001 stemming from massive accounting irregularities at software subsidiary HBOC to the tune of $40 million. On the day of the disclosure, McKesson’s stock dropped by almost half. "John was in a meeting and was pulled aside. The board said they wanted him to be CEO. He was fully briefed and they believed the company wouldn’t make it, that’s how bleak it was," explains Fortner. "His goal was to try to stabilize the ship and keep the company going as long as he could." "John managed to not only stabilize, but also grow the company from being a large US wholesaler to a global healthcare services company," he continues. McKesson agreed to pay $960 million to settle shareholder lawsuits related to the HBOC deal in 2005. Despite Hammergren’s success at resuscitating the company – McKesson reported $1.5 billion in net income on $179 billion of revenue in the fiscal year ended March 31, 2015, a 30% increase over 2015 – his pay has come under fire. He earned $25.9 million in the company’s 2014 fiscal year and $51.7 million in 2013. In early 2014, Hammergren agreed to cut his $159 million pension benefit by $45 million and McKesson revamped its incentive-compensation program for top execs in the wake of complaints from activist investors. "In the past year a lot of the attention around compensation has certainly faded as those changes have been made," says Fortner. McKesson also had to contend with lawsuits by states and the federal government, among others, from 2005 to 2012 alleging it inflated drug prices. Although the company denied any wrong doing, it agreed to pay $689 million to settle suits. Fortner is in regular contact with key partners including the law department, general counsel, government relations, and investor relations. "A company of our size is going to have a fair amount of issues that come up, some in the form of litigation. When one arises, we quickly get on the phone and talk through the strategy, understand exactly what is going on, and make sure we’re all aligned on our responsibilities," he says. "Once you have the alignment and open lines of communications, it becomes muscle memory and you learn to get in sync with your broader team." There is renewed energy around efforts to advance health IT interoperability with bills making their way through Congress. "We’re very supportive of the intent of the legislation to foster interoperability," notes Fortner. "You won’t have to go into the physician’s office and fill out the clip board for the 13th time; it’ll all be available seamlessly. For this to happen there needs to be wide adoption of a common set of standards."